Brazilian Ray was dreaming of a cross country trip from Makapuu today - we met at Hygienic to leave his truck, but the clouds were so low we had to cancel that plan. Nevertheless, we were still vaguely optimistic as we headed out there to meet Scot. We launched Crazies and got up easily in strong northeast conditions. It seemed a bit strong for an XC trip, but Ray jumped back to Puu O Kona and Greenwalls without hesitation. I followed him, but the wind strength was definitely a bit spicy for my comfort level, and I bailed back to Makapuu as soon as I got high enough back there. Ray returned soon after, disappointed not to have gone further. Next time! 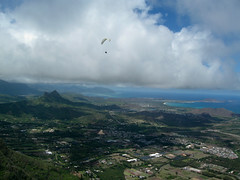 Scot and Ray frolicked up and down the ridge in their matching SOL wings, and Reaper showed up to do a tandem with his new student Larry from Arkansas who has a son in Kaaawa. We all landed to enjoy some cold refreshments before I had to leave to pick the kids up from school. Just before I left, Jim, Jeff and Steve showed up to launch Crazies. (Thanks to Jeff for the coconut iced coffee. That stuff really wakes me up!) I watched Jeff launch, then gasped as I watched Jim plunge off of Crazies and proceed towards Manics on a ridiculously low tack - but he found some lift below Manics and benched up for the lowest save I've seen there. Wow! I had to leave at that point, but I heard that Steve had an exciting bomb-out landing on the beach soon afterwards, and later on Jetflap showed up for his very last Makapuu flight as a Hawaii resident - he and Lana leave tomorrow for Oregon. But I trust we will see them again soon as visitors!